In recent years, rosin has become popular among cannabis patients and enthusiasts alike. Featuring a sticky consistency, similar to sap, rosin is rich in terpenes and cannabinoids. When made properly, rosin rivals any cannabis extract on the market today. In fact, some say rosin is the future of cannabis concentrates. Here are just a few of the many amazing benefits of rosin. If you’re interested in entering the cannabis industry as whole feel free to contact us at anytime. 21,000 Followers on Facebook and growing! #Investors seeking to find businesses worthy of your #investment should contact us. We can assist you with this search. If you’re ready to enter the cannabis industry or expand your current establishment & you’re seeking cannabis business assistance, establishing a network with medical and / or recreational cannabis patients/customers, physicians, advocates or any other Cannabis related businesses then we can discuss hiring us as Cannabis Consultants. 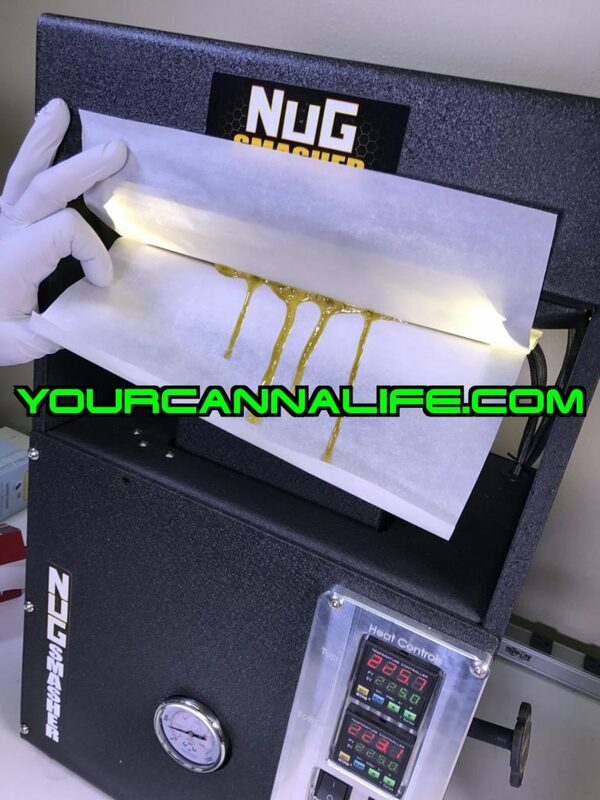 Rosin is an extraction process that combines heat and pressure to make solventless hash oil (SHO). This technique produces a high-terpene and cannabinoid-rich resin. While you can make rosin at home with a hair straightener, using the right equipment greatly improves the quality of your product. For best results, use a rosin press. Unlike a hair straightener, a rosin press is precise. A rosin press will apply the right amount of heat and pressure to properly extract cannabinoids and terpenes. While rosin looks nearly identical to other cannabis concentrations like BHO, there is one huge difference. Rosin is completely solventless. Unlike BHO (butane hash oil), rosin does not require a solvent. Which means there’s zero risk of residuals in the end product. The result is purer meds. Butane is extremely harsh on the human body and the environment. Rosin produces a completely clean, potent product when extracted properly. In fact, rosin is comparable to BHO in potency. For patients who need pure and powerful meds – the choice is obvious. Extreme precautions must be taken when producing butane extractions. Butane is highly flammable and susceptible to explosion. It is an extremely volatile substance. Unfortunately, a large number of accidents have occurred from people trying to produce extracts with solvents like butane. Granted, many of these accidents were caused by amateurs who did not follow safe extraction methods. Nevertheless, making concentrations from butane is risky business. Even when handled with the utmost care, butane still poses considerable dangers. Serious harm or even death can occur. Rosin completely avoids these risks. Did you know that with the right equipment, you could make rosin in a few minutes? Rosin presses apply heat and pressure. This combo liquefies the terpene and cannabinoid content in flower into a sticky wax. The process of making rosin is incredibly efficient. In a single day you can make high-quality concentrates. For new labs or caregivers, this is a huge advantage of rosin in comparison to closed-loop systems, which can take months, or even years to get up and running. The cost producing solvent-based extractions is shockingly expensive. According to High Times, assembling a closed loop extraction set up is between $100,000-200,000 or more. These costs are just representative of your startup expenses. Let alone your production costs. Rosin extractions, on the other hand, can run as little as $1,000 for a high-quality setup. This is minimal compared to what you would be looking at for producing BHO. Not to mention making rosin you don’t face anywhere near the same level of hazards you do with closed loop extractions. Running a rosin business is a smaller, safer, and in many cases, more profitable investment. Some reports indicate rosin can have 50 to 70 percent THC content. Flower, on the other hand, normally comes in around 25-30%. The effects of rosin are therefore much stronger. The rich cannabinoid and terpene content of rosin make it a popular choice among patients. Less product is needed for the same desired effects. Pure and potent, rosin is economical and practical. It is also a cleaner option when processed properly because there are no additives. Need a fast but powerful dose of cannabis? Rosin is a great choice. Because it is a concentrated form of cannabis, rosin is loaded with cannabinoids like THC and CBD. One dab of rosin provides a large dose of cannabinoids quickly. You would need to smoke 3 to 4 times the amount to get the same quantity of cannabinoids as dabbing rosin. With rosin, a little bit goes a long way. The strong effects take hold swiftly so it’s best to dose a small amount at a time. Rosin is beneficial for patients who need fast acting powerful doses of cannabis medicine. Hands down, rosin is one of the most versatile cannabis extracts. In fact, with rosin you can make crumble, wax, budder, shatter, sugar, and more. This is huge! Rosin enables you to make your favorite concentrates completely solvent-free. The versatility of rosin is astounding. It can be incorporated into just about every cannabis product you can imagine including edibles, topicals, and salves. Rosin can also be consumed immediately. You can dab, vape, or add rosin to a joint or bowl right after making it. No additional processing is necessary. The adaptability of rosin is a big benefit for cannabis consumers and producers. While rosin is not a new discovery, the technology we are using to produce it is. Today, we have made great strides in perfecting the rosin making process. The right equipment melts flower at the ideal temperature for extracting cannabinoids and terpenes. Creating clean, potent, and pure extracts has never been easier. Are you interested in making rosin?